They clarify the potential options for working towards achieving these results and clarify the consequences of each option. They clarify their chosen route and make clear action plans for achieving the results. The quality of the information they gather. 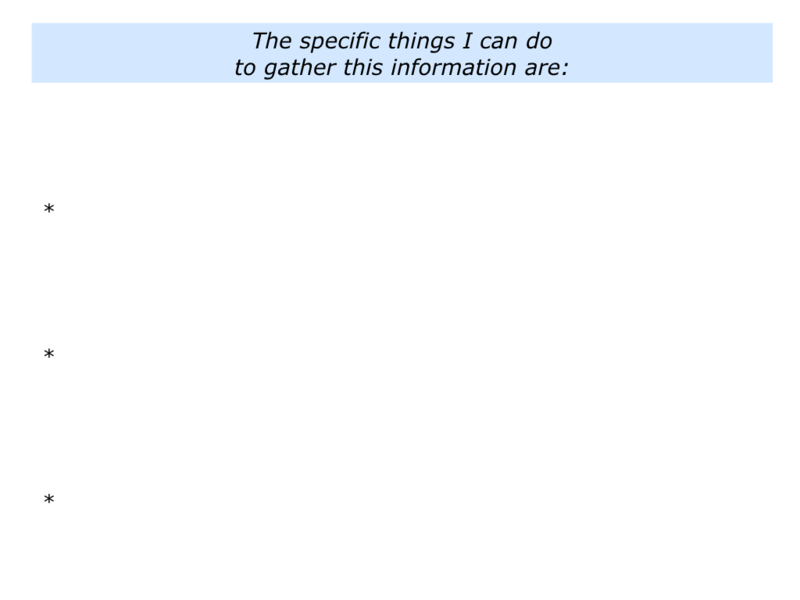 The quality of the due diligence they go through before making the decision. 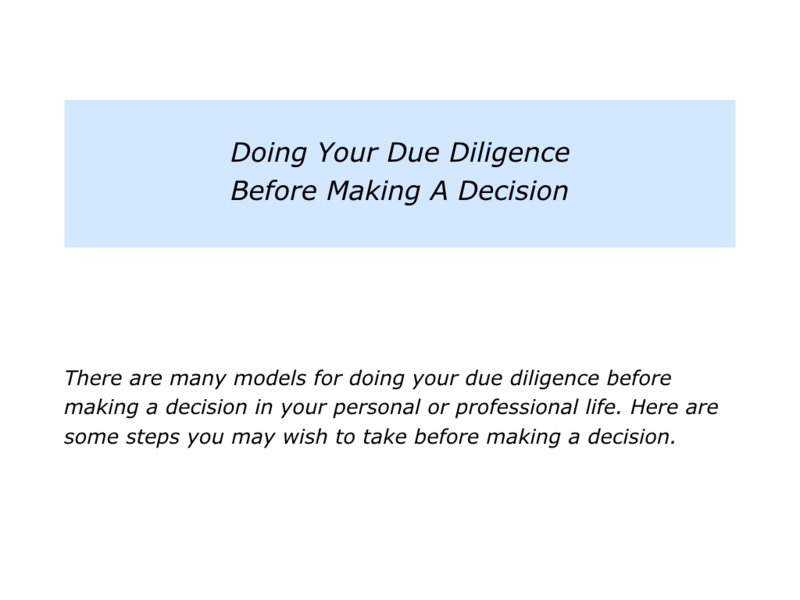 There are many approaches to doing your due diligence before making the decision. This article looks at the following themes you may wish to explore. Let’s explore how this approach works in action. 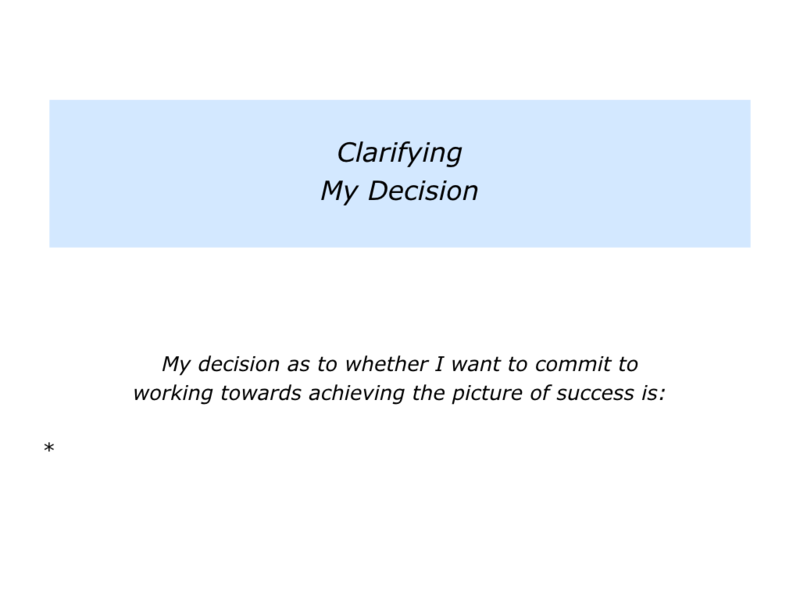 Imagine that you want to make a decision about something in your personal or professional life. You may be exploring different treatments for an illness, taking a decision that will affect your company’s future or dealing with a difficult challenge. Describe a specific topic you want to make a decision about. 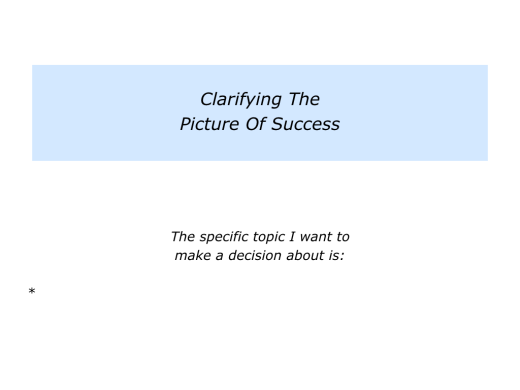 Describe the specific reasons why you want to make a decision about this topic. Imagine you are exploring different treatments for tackling a potentially life threatening illness. What are the real results you want to achieve? You will obviously want to regain your health. Bearing this in mind, you will research the various treatments on offer. This will also involve considering the pluses and minuses of each treatment. 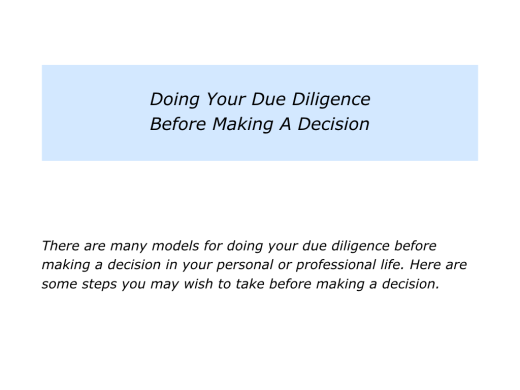 You will then make a decision regarding how to proceed. For some people this issue can become complicated. A person may be faced with the choice of continuing with invasive treatments that may prolong their life or opting for pain management. They may then choose the latter and aim to appreciate the rest of their life. Imagine a different scenario. You have been invited to apply for the role of leading the European arm of a US based company. The message you have been given is that you stand a good chance of getting the role. 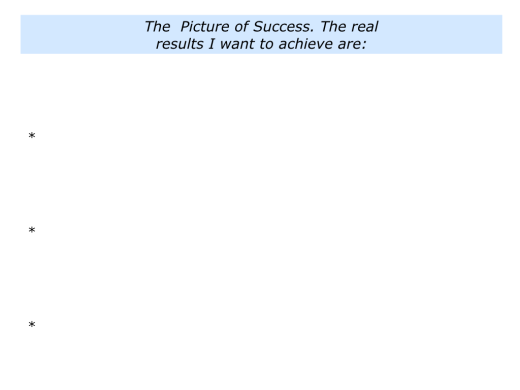 What is your picture of success? Bearing in mind the goals you want to achieve in the first two years, you say something like the following. To have delivered the results the company and I agreed in terms of the profits, product quality – including customer satisfaction – and people’s wellbeing. To have created a positive culture in which motivated people have done superb work and delivered peak performances. To have spent quality time with my family and continued to help them to enjoy a healthy and happy lifestyle. Describe the specific topic you want to make a decision about. 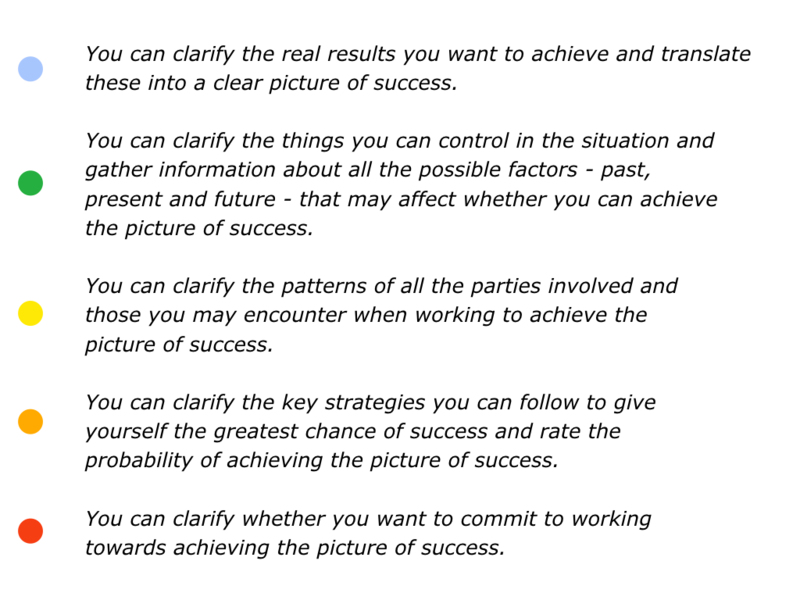 Describe the picture of success – the real results you want to achieve in the situation. Good decision makers aim to control the controllables. They build on what they can control and manage what they can’t. 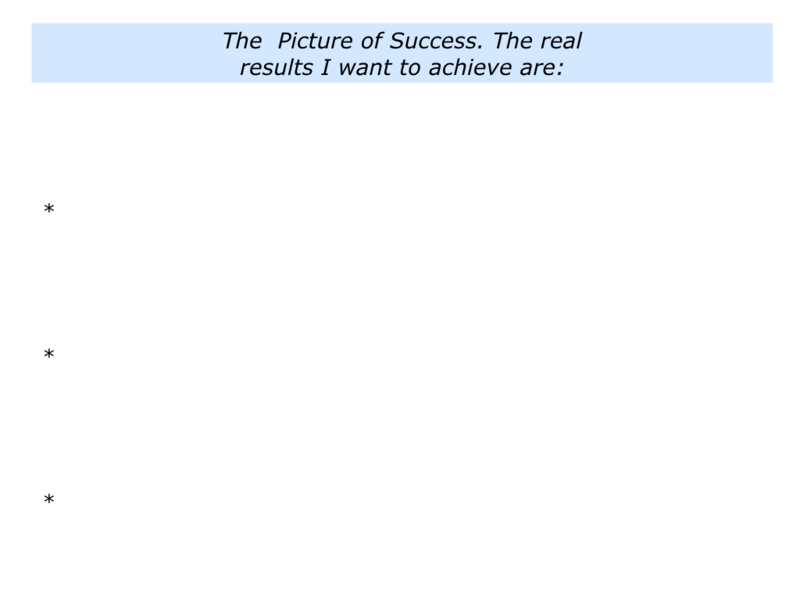 They then do their best to achieve the picture of success. Imagine that you face a decision regarding tackling an illness. It will be important to, as far as possible, keep doing things that give you positive energy. This will help to keep defining yourself as a positive person, rather than as an illness. Let’s consider what you can control. You can choose your attitude. You can research the different treatments. You can explore what other people have done in your situation. You can try to find the best available practitioners in the field. You can explore how it may be possible to get treatment from those people. You can then make a decision about the route you want to choose going forwards. You can keep doing your best, but you can’t necessarily control the outcome. Imagine that you are applying for the leadership role. 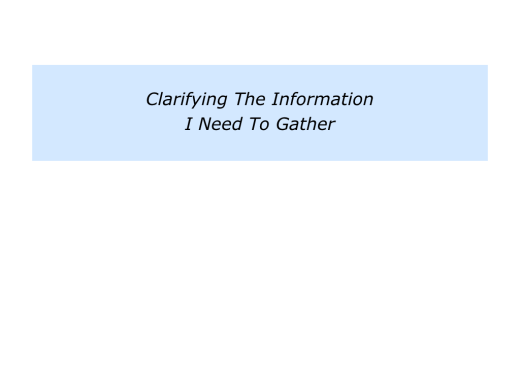 It will be important to clarify what you can control within the parameters of what must be delivered to the company. You may be able to set the team’s strategy, hire people who demonstrate the right spirit and have the autonomy to make certain decisions. You may not be able to control your bosses, the market or other factors. Due diligence also calls for gathering information about factors that could affect the team’s chances of success. These can include the team’s strengths, weaknesses and relationships with its customers and internal stakeholders. You can also anticipate potential changes in the market and how these could affect the team’s future. If you wish, try tackling the exercise on this theme. 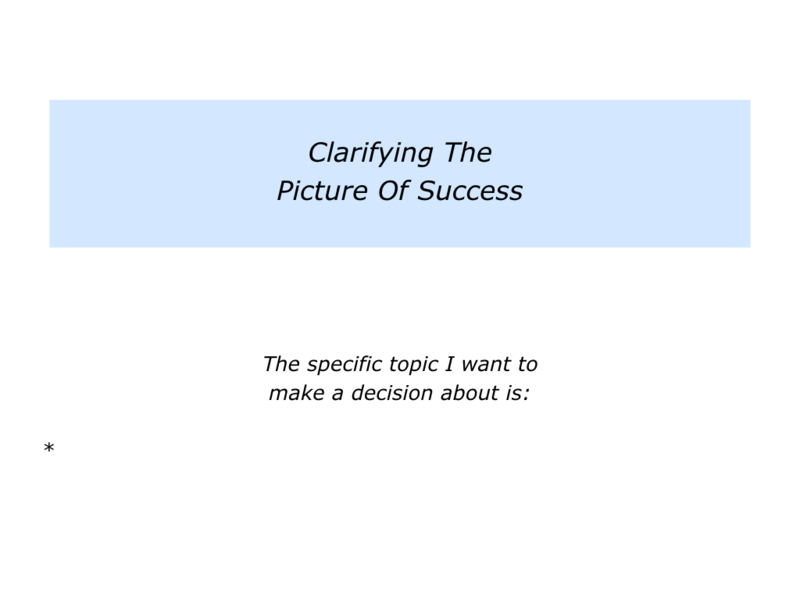 Imagine that you are making a decision regarding a particular topic and have clarified your picture of success. This exercise invites you to do the following things. Describe the specific things you can control in the situation. 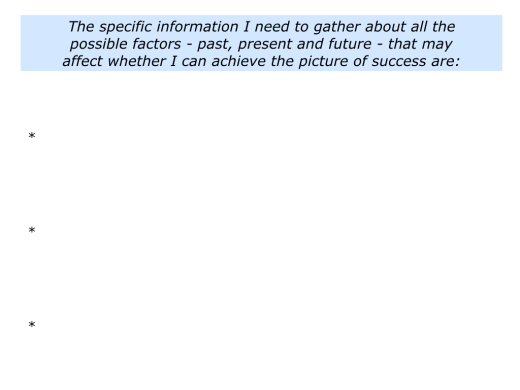 Describe the specific information you need to gather about all the factors – past, present and future – that may affect whether you can achieve the picture of success. 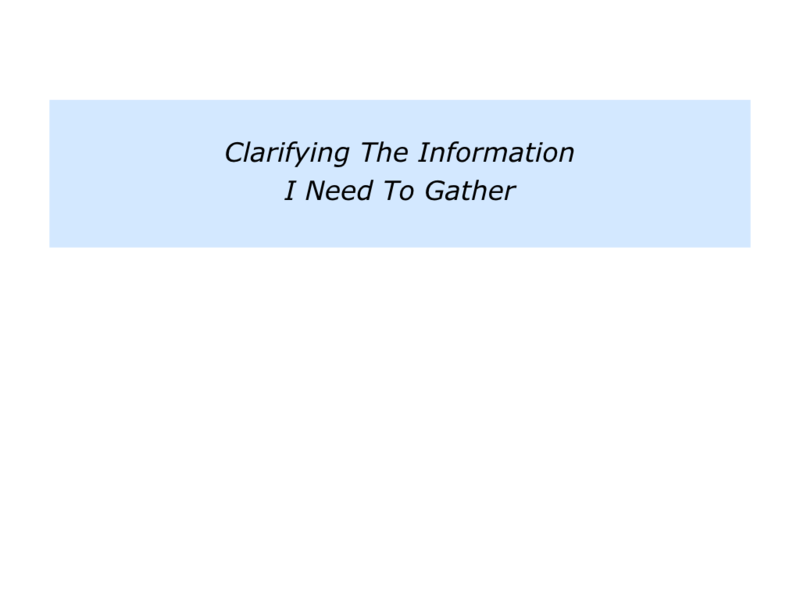 Describe the specific things you can do to gather this information. Imagine that you are applying for a leadership role. 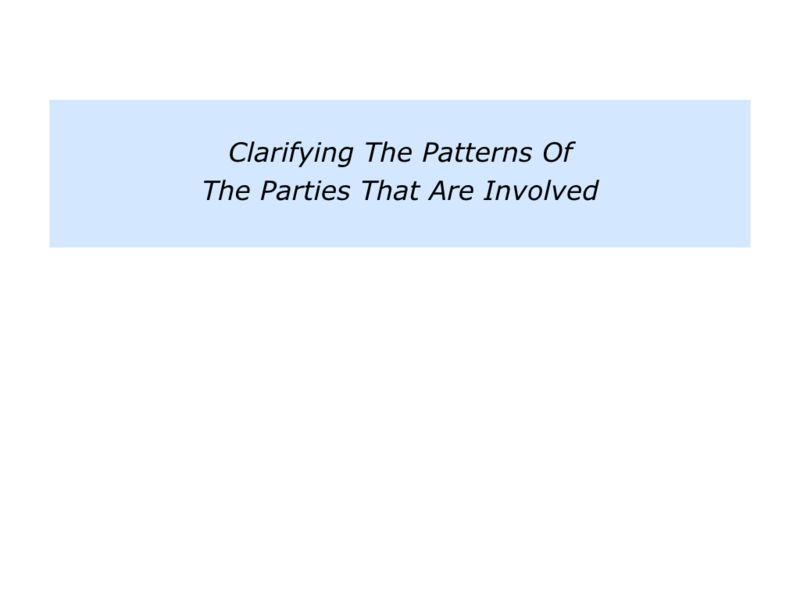 It will be vital to understand the patterns of all the parties that you may encounter when doing the work. People are relatively predictable. They seldom dramatically change. So it is important to understand the behavioural patterns that people follow in their lives or work. This gives you an idea of how they may behave in the future. The bosses that you will report to … The other key stakeholders in the business … The peers you will be working with … The individual people in the team. How do these people behave? How do they encourage people? 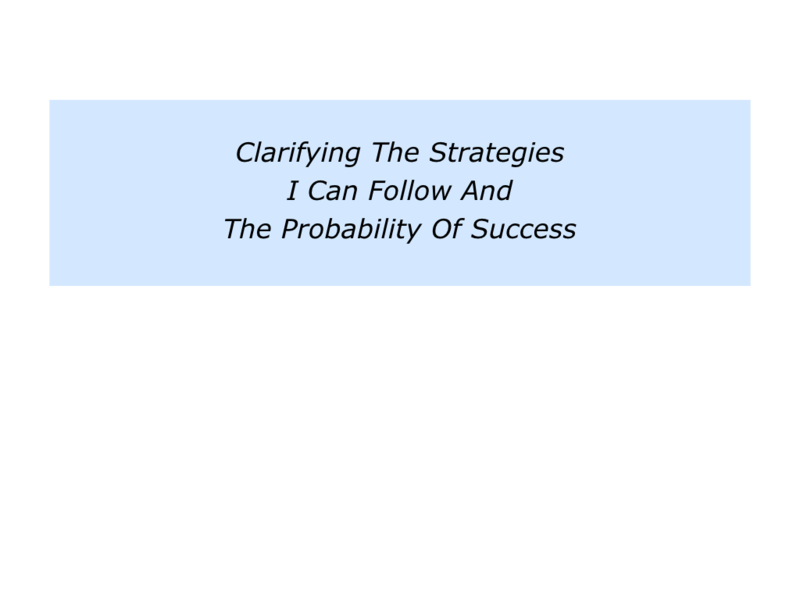 What are their successful and unsuccessful patterns? How do they behave when under pressure? How do people feel after interacting with them? How might they continue to behave in the future? What are the real Dos and Don’ts that people are expected to follow in the company? What are the behaviours that are rewarded? What are the behaviours that are ignored or punished? 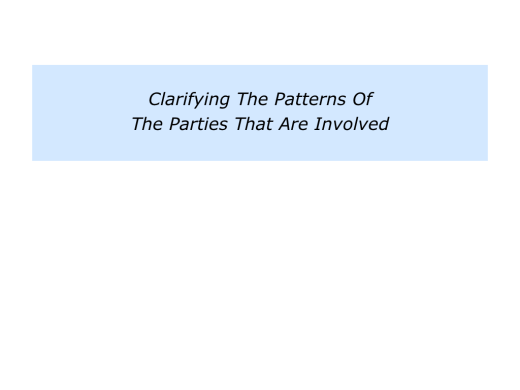 What are the company’s successful patterns? When have people in the company performed brilliantly? What did they do right then? What were the principles they followed? How can they follow these principles in the future? What are the company’s self-defeating patterns? What does it sometimes do to discourage people? What would it need to do to encourage people instead? 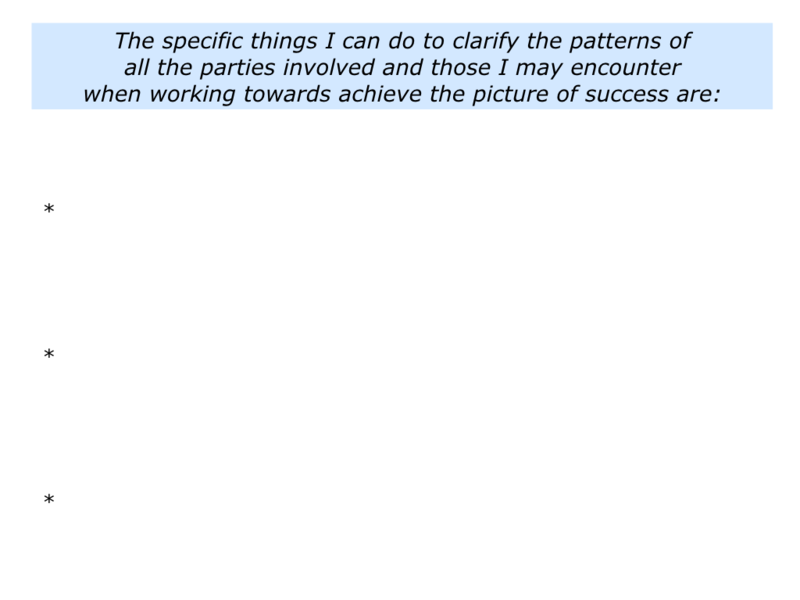 How could you build on the company’s successful patterns and deal with any unsuccessful patterns? 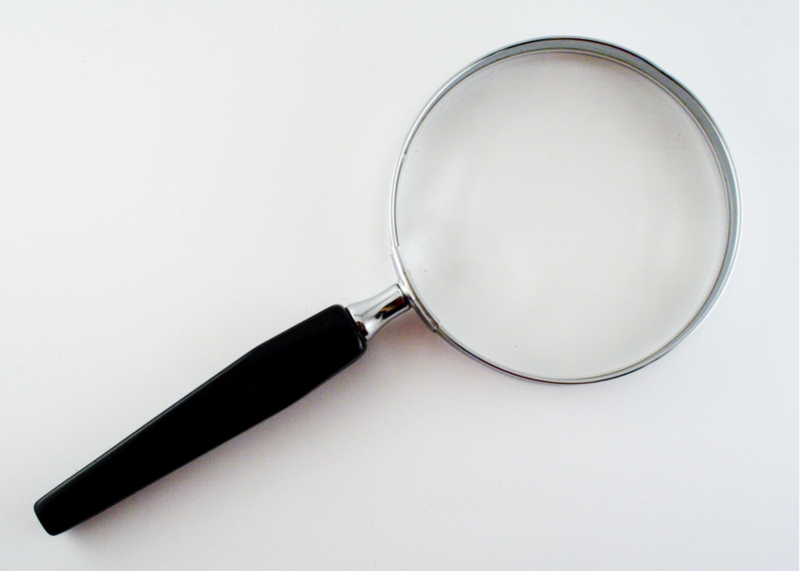 Do your due diligence regarding the company’s culture. Go in with your eyes open. Be clear on what you can and can’t expect if you join the company. Imagine that you are making a decision. 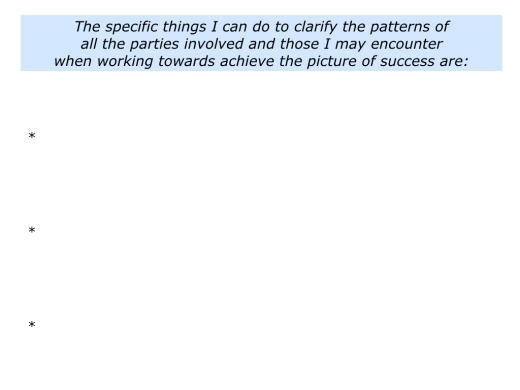 Who will be the parties – the people, organisations and other bodies – that you may come into contact with as you work to achieve success? Depending on the issue you want to tackle, these may be include certain individuals, bosses, peers, team members, organisations or other bodies. What can you do to find out about their patterns? What are their positive patterns? What are their not so positive patterns? Bearing these in mind, what can you expect in your interactions with these people? If you wish, try tackling the exercise on this theme. This invites you to complete the following exercise. 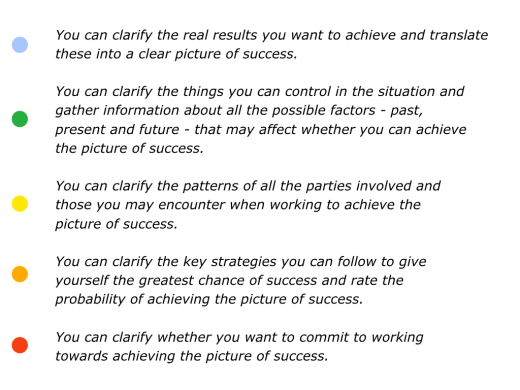 Describe the specific things you can do to clarify the patterns of all the parties you may encounter when working to achieve the picture of success. Imagine that you have done lots of research. It can now be time to take stock and consider the route ahead. Good decision makers often buy time to reflect and let ideas incubate. Different people do this in different ways. They may sleep on the matter, take walks or do other things to release their minds. 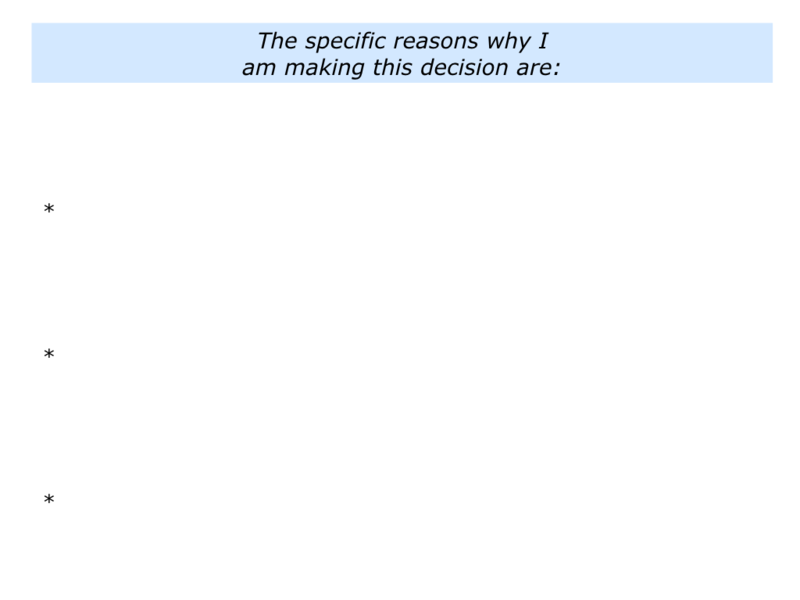 Such decision makers then get to the heart of the matter. 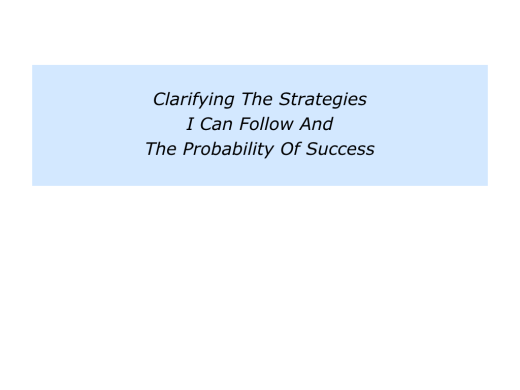 Bearing in mind the real results to achieve, they explore the key strategies they can follow to give themselves the greatest chance of success. They focus on the following themes. Good decision makers are positive realists. They have a positive attitude to life but are also good at reading reality. Let’s return to the decision you are facing. If you wish, try tackling the following exercise on these themes. This invites you to do the following things. 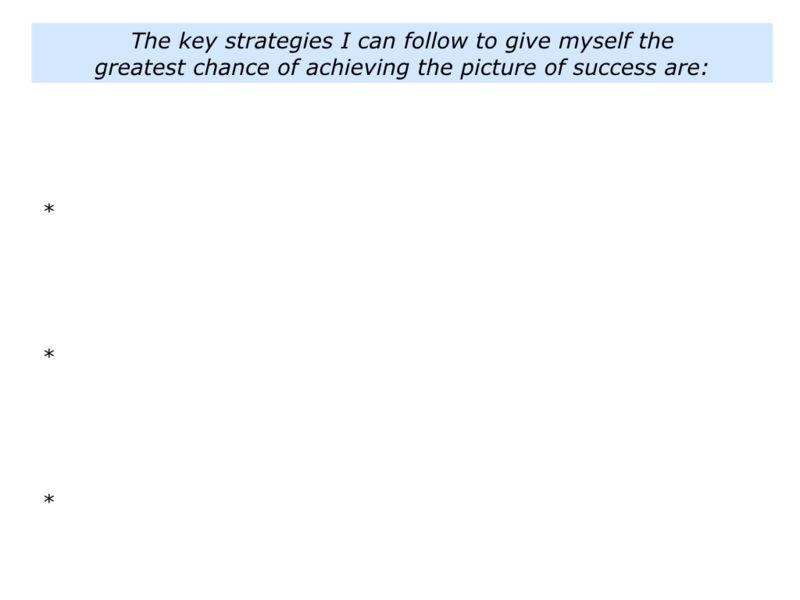 Describe the key strategies you can follow to give yourself the greatest chance of success. 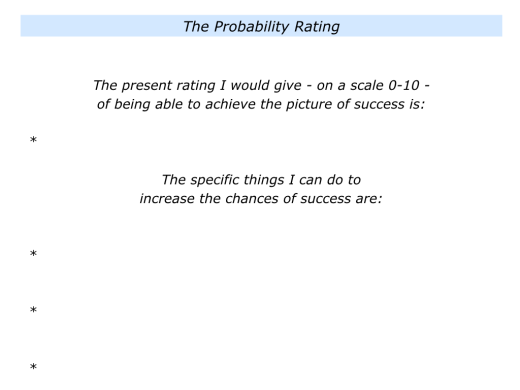 Describe the present rating you would give – on a scale 0-10 – of being able to achieve success. 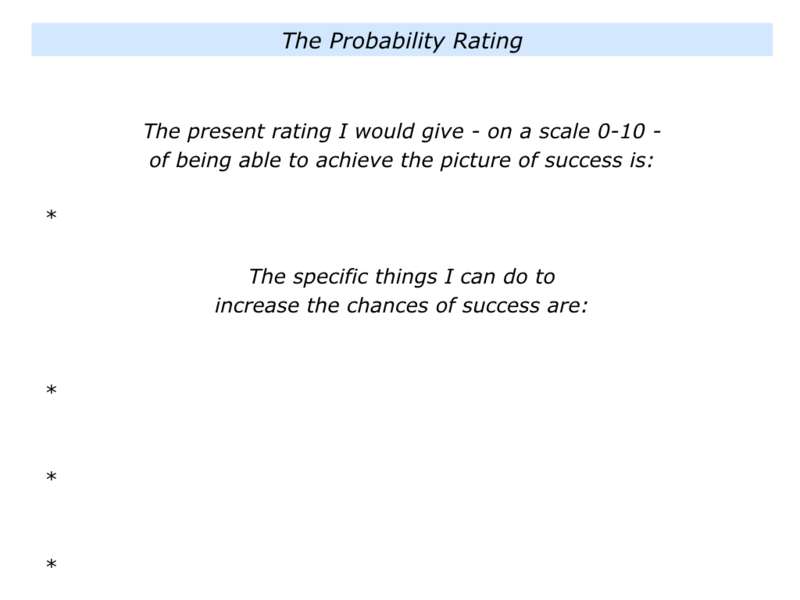 Describe the specific things you can do to increase the chances of success. Imagine you have done all the research and ratings. It is now decision time. You may be faced with choosing to pursue a particular treatment, take a leadership role or tackle another challenge. Bearing in mind the issue you face, which route do you want to follow? On a scale 0-10, how motivated do you feel to pursue the particular route? What can you do to increase your motivation and also the chances of success? Great workers, for example, translate their strategies into a clear action plan. They then commit to the commitment. They rehearse what they plan to do, follow a daily rhythm and deliver the required results. Such workers feel they are building on solid ground – rather than dangerous ground – because they have done their due diligence. They have the confidence to move forward but also use their antennae to watch for warning signs. They then do their best to achieve their picture of success. Let’s return to the decision you may want to make. If you wish, try tackling the final exercise on these themes. This invites you to do the following things. 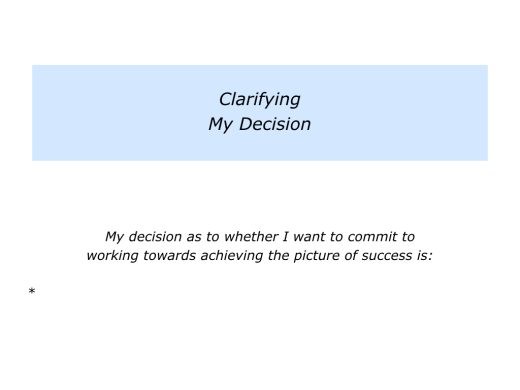 Describe your decision regarding whether you want to work towards achieving the picture of success. 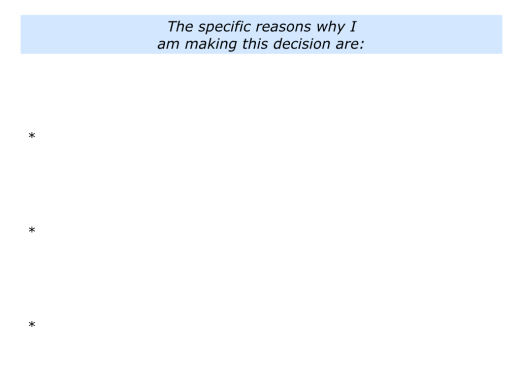 Describe the specific reasons for making this decision. 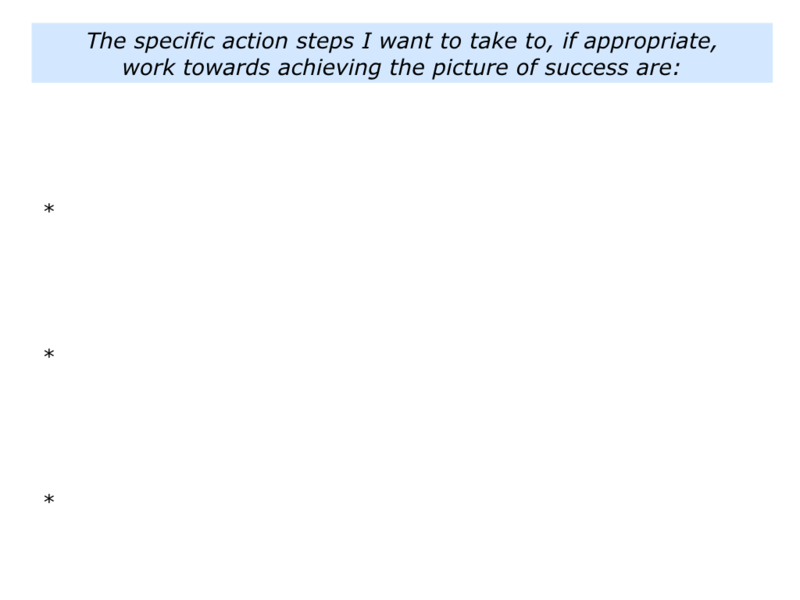 Describe, if appropriate, the specific action steps you want to take to work towards achieving the picture of success.